So apparently its National Burger Day. If you’re not on Twitter, or not looking at trends on Twitter, now you know lol. So what’s ironic, is that as a past vegetarian, I will be writing this post. Keyword past. Please do not consider me a trader vegetarians, but recently I have been loving hot dogs and burgers. Predominately burgers. McDonald’s burgers, grill em at home burgers, Steak n Shake, Shake Shack, you name it. I’ve tried them all since giving up being a vegetarian and it seems unlikely at this point that I will stop. Burgers are satisfying in a weird way. Not that tofu is not satisfying. Veggie burgers are tasty and good. But veggie burgers are so light that they sometimes leave you wanting a little more. This is not me shooting down being a vegetarian. If you don’t like beef or burgers (or meat in general) more power to you. But some people just cannot give it all up. I didn’t eat beef for at least five years and gave up meat entirely for about two or three years. Chicken is just chicken but when I tried a burger again, I knew in my mind I would not be able to stop. Maybe I’ll celebrate National Burger Day by eating one, who knows? If you don’t eat beef, try a turkey burger. Or if you don’t eat meat at all, try a veggie burger. Everyone can celebrate National Burger Day, don’t just leave it for the meat eaters lol. Wel l I’m a hunky piece of man meat myself, so I can’t say anything for you vegetarians jk. 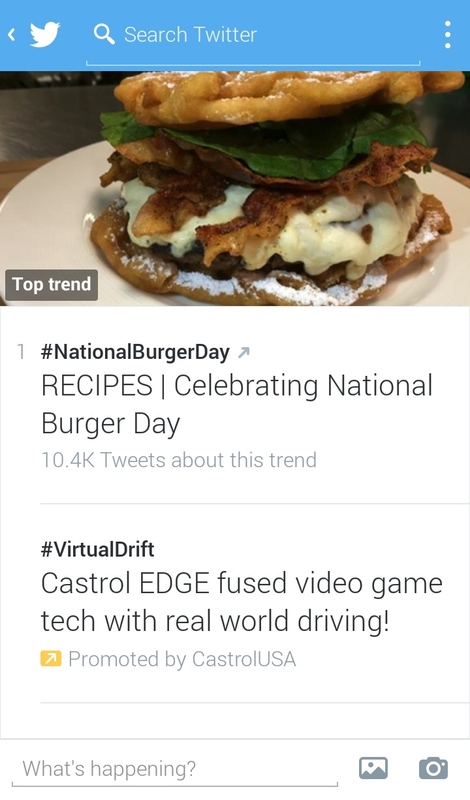 I don’t follow much social media but this is very interesting there is an actually burger day? If so does that mean there is a hot dog day also? Where can I find a good burger to celebrate? And don’t say macdonals because we all know that’s not the truth. I love burgers and this is just an opportunity to find the best burger (The Vortex-Atlanta) and chow down in celebration!!!!!! OMG!!!! I love a GOOD burger!!! Happy National Burger Day Everybody!!!!!! Yup. Happy National Burger Day!